On-Premise, Cloud, Or Hybrid: Which Strategy Is Best? It is a question that is thrown at me frequently. Most software vendors expect that only 20% of enterprises will run full cloud analytics in 2020. What about the rest? And what should you decide today: cloud analytics or on-premise? Is there an easy answer? It may seem not … but hybrid business intelligence is! Before we can understand why there is a discussion for cloud analytics and/or on-premise analytics, we need to recap the market situation. When it comes to analytics, our world has changed dramatically, and it is still changing. This is all part of digital transformation. Where we initially shifted into renewed business networks with things like video collaboration, mobile devices, connected things, and other technologies, we are now moving into insight-driven experiences using structured and unstructured data in real time and online. This change is massive. Today we connect everything: devices, people, data, and processes. Enterprises, of course, undergo similar experiences, and this changes the way they compete. Data is the key asset in this competition, so enterprises make data their strategic differentiator. Data has become the new gold. Meanwhile, new technology has also emerged. Besides in-memory computing, we now have stable cloud platforms that leverage in-memory computing and boost performance tremendously, much needed considering today’s massive data generation. These cloud platforms also reduce maintenance and support efforts while also offering the scalability enterprises need. Analytics vendors started to provide cloud analytics tooling. Some cloud solutions went a step further by providing both monitoring, planning, and predictive capabilities all in one tool: the closed-loop portfolio. Yet it is predicted that by 2020, only 20% of the enterprises will run full cloud analytics. Why only 20%? Because not every organization applies today’s use cases to run analytics and business intelligence in the cloud, and some are not ready to shift to cloud analytics. What about all the others? They still run on-premise analytics. Software vendors continue to innovate on-premise software, enabling it to handle the latest needs for agility, data volume and complexity, and real-time capabilities. In the long term, we predict that enterprises will shift to cloud analytics, but that transition will take another 7-10 years. In the meantime, analytics techniques must further evolve to meet the needs of insight-driven experience and data-driven strategies. Now the question is: What should software vendors do—focus on cloud analytics or innovate with on-premise? To answer the question of whether software vendors should focus their developments on cloud analytics or on-premise, it’s important to consider the intentions of enterprises and their strategy on data insight. As data is a core asset to remain competitive, enterprises are shifting from the more traditional descriptive analytics (typical monitoring) into predictive analytics. Simply said: Where descriptive analytics tells us what happened and how it happened, predictive analytics tells us what could happen. One thing is certain: We must bring analytics to where the data is created. That’s where we can create the data intelligence algorithms that enable the enterprise to predict which analytics questions it needs to ask: adaptive enterprises. Everything must be analytics-enabled. We must have integration for predictive models and machine learning for a closed-loop system. If we can all accomplish that, the world will be ready for the opportunity of monetization and designing business models for subscribing to the outcomes of data. Bringing analytics to data means enabling almost any application with analytics. Given the fact that the future of applications is in the cloud anyway (companies will also start using applications to their needs; a typical cloud model), we can also conclude the future of analytics is in the cloud. Enterprises, however, drive the speed and adoption towards adaptive organizations. They might shift in an iterative manner, or in chunks. Accordingly, they also drive software vendors to focus on either on-premise or cloud. 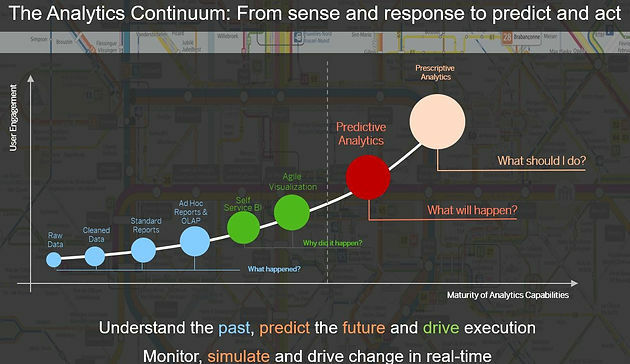 Therefore, the immediate answer is to focus on hybrid analytics. This means innovating on-premise software tools while at the same time evolving cloud analytics. Align them and make them interoperable; cloud analytics must be able to interconnect with the vendor’s on-premise analytics, and vice versa. The long-term strategy of analytics vendors should be on cloud analytics. However, the adoption of cloud analytics is progressing at such a rate that in 2020 we can expect 20% of all enterprises to be running full cloud analytics even as the vast majority still runs on-premise. Digital transformation continues, and enterprises must move forward by using data insight as competitive advantage. The short and mid-term strategy for software vendors can thus be only hybrid. Visit Iver van de Zand’s blog for more on analytics and business intelligence.